In the UK today, many students are leading difﬁcult, isolated and troubled lives. With concerns such as rising competition for university places, high levels of debt amidst a declining job market, isolation from family support, as well as the pressures of 24 hour social media and the potential for cyberbullying, it is no wonder that around one in ten people within this category self-harming regularly and nearly 80,000 diagnosed with severe depression, the necessity of tackling and breaking the stigma is vital in tackling this serious problem. If left unchecked, ignoring student mental health can lead to: higher drop-out rates, declining exam results, damage to the university’s REF rating and reputation and declining intake ﬁgures. Mental health is an issue that must be addressed in a sensitive and de-stigmatising manner. It was important that we cover the range of mental health illnesses that students may face in a way that opens the conversation and allows staff to be able to identify where a student may be suffering from mental health issues and to be confident in signposting them to the relevant services. 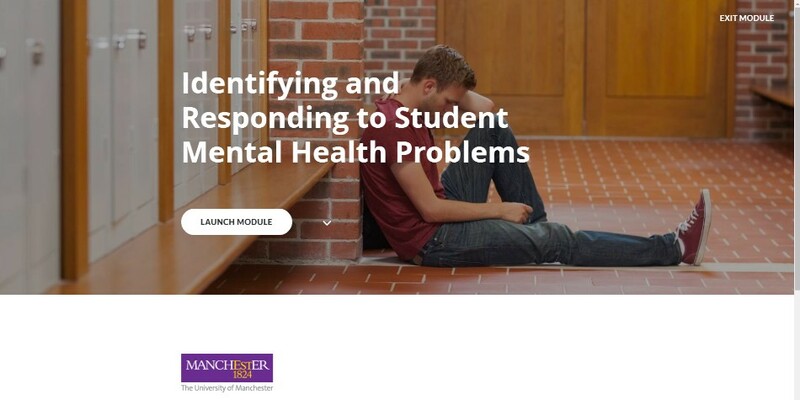 To this end, we partnered with Manchester University to provide staff members with this information and to give them the confidence to know how best to broach the issue with students. We wanted to make the course as relevant and as realistic as possible, so we designed the course in a way so that each of the key mental health problems facing students is dramatised in scenarios specific to the HE context. We also designed the course to be fully accessible on mobile devices, so that staff members can complete the course and access its resources whilst on-the-go. The reception of the course has been very positive and has helped staff members in Manchester and Exeter Universities.